Stanley Combination Square 12 in. 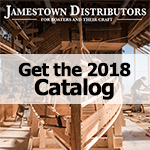 Tape measures, long tapes, calipers, levels, squares, bevels, scales, rulers, thermometers, pencils, and more measuring and marking tools available from Jamestown Distributors. Stanley and Lufkin Tape Measures are industry standards. Tape measures or measuring tapes have ribbons of cloth, plastic, or metal. Their flexibility and portability allow easy measuring around curves and other difficult areas. Tape measures appropriate for the rigors of workshop/garage/boatbuilding/woodworking have a stiff, curved metallic ribbon that can remain stiff and straight when extended, but retracts into a coil for easy storage. The Tang of a tape measure is the lip on the end that moves a small amount to allow for accurate measurement. Boat builders, woodworkers, and many Do-it-yourselfer's rely on marking and layout tools like pencils, carpenter's pencils, and chalk. Levels are an indispensable tool for accurate layout. The classic levels with the 'bubble' and centering lines are also called Spirit Levels or Bubble Levels. These are the kind found in most toolboxes. They have a glass tube, usually incompletely filled with ethanol or a similar substance (ethanol was chosen because it does not freeze until -114 degrees Celsius!). These levels are employed to indicate how horizontal (level) or how vertical (plumb) a surface is. There are different types of spirit levels for different uses: Surveyor's leveling instruments, Carpenter's level, Mason's level, Torpedo level, Post level, Line level, Engineer's precision level, and Electronic level.